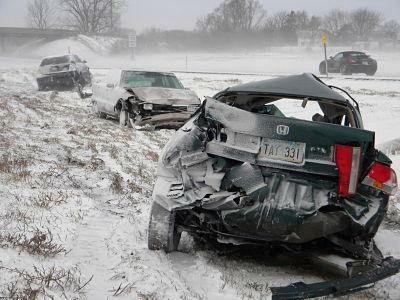 Cars off I-70 during the work commute Thursday morning. The Kansas City metro area experienced its first winter storm overnight Wednesday. Strong winds contributed to whiteout conditions for the morning rush hour. Dozens of schools are closed Thursday including Blue Valley, Kansas City, Kan., Kansas City Public Schools, Lawrence, and Shawnee Mission. For a complete list of school closings, click here. 11:40 a.m. The National Weather Service has cancelled the winter weather advisory: "Snow has ended over the warning area, however sustained winds will remain between 20 to 30 mph with occasional gusts to 30 mph through 3 pm." 9 a.m. KMBC reports that the winter storm is starting to wind down. "Blustery flakes" should continue throughout Thursday morning, but the sun should be out by Thursday afternoon. No more snow is predicted for the weekend. In the Kansas City metro area, the National Weather Service reports snow is expected to continue though 9 am Thursday, with blowing snow and a chance of snow between 9 am and noon. Snow accumulation of 1 to 3 inches is expected. 8:20 am: MoDOT's Steve Porter tells KCUR: "We are experiencing near blizzard conditions. And if you can avoid going out, just stay put. The high wind and the high rate of snowfall in a short period of time has made it very difficult. Not only is the blowing snow and drifting snow making is difficult to keep the roads clear, but visibility is very poor." 7:40 am: Westar Energy is reporting 12,405 customers without power. Check their website for updates. 7:26 am: Courtney Hughley, KCP&L spokesperson tells KCUR: "Right now, we have about 30,000 customers without power, about half of those are here in the Kansas City metropolitan area and the other half are scattered throughout our service territory. We've actually started to see that number grow as the morning drive time gets started...we start to see accidents and people running into some of the infrastructure. That would cause additional outages." Check their websites for updates. 7:20 am: @MoDOT tweets: "Travel not advised in the Kansas City and Northwest Mo. region due to heavy snow, wind and covered roads." 7:09 am: @MoDot_KC tweets: "ALERT! I-29 (MM) is CLOSED from St. Joseph to Iowa State Line due to blizzard-like conditions until further notice." 7:00 am: @KansasCityKDOT tweets: "As of 7 am, EB/WB US-36 from Wathena to the KS/MO State Line NOW CLOSED due to multiple slide-offs." 6:19 am: @KCIAirport (Kansas City International Airport) tweeted "some delays & cancellations due to conditions." Check their website for the latest information. 6:06 am: According to KMBC, KCP&L reports 16,000 customers without power. 6:04 am: More than 150 schools are closed. Check here for a complete listing. Find a full hour-by-hour forecast from KMBC here. Check back here for the latest on severe weather alerts and school closings from KMBC.com. 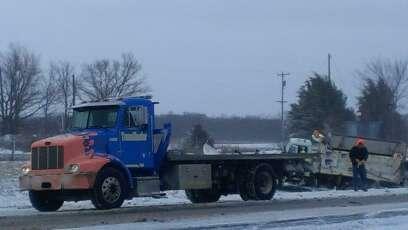 @NWKansasKDOT tweeted Wednesday that Kansas road conditions and closures updates can be found at www.kandrive.org and ksdot.org. For a snow plow map of Kansas City, click here. For a snow plow map of Overland Park, click here. The Kansas Highway Patrol has a list of important safety tips if you have to be out on the road during inclement weather. Most importantly, slow down, turn on your headlights and turn off your cruise control. For the Patrol's full list of safety tips, click here. Get video updates from the National Weather Service here.